Happy Halloween, fiends!! Thanks for joining me on the 31 Days of Halloween countdown! I hope you had as much fun as I did. I cannot believe it is already over and that it is Halloween, the best day of the year! 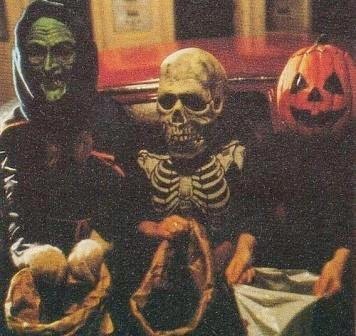 I want the season to start all over again and it's bittersweet that another Halloween season is nearly over. I wanted to take a look back to appreciate all the bucket list items I completed this month. Let's take a look at my original bucket list and see what items I completed and can cross off, shall we? I am pretty obsessed with the Marbled Banana Bread from Isa Chandra Moskowitz's cookbook Isa Does It, cuz who wouldn't be in love with that banana and chocolate combo?! Out of curiosity and for my love of all things pumpkin, I did a search on Isa's Post-Punk Kitchen site to see if she might have a similar recipe with pumpkin-y, autumn flavors. I ended up hitting the jackpot and found her recipe for a Chocolate Pumpkin Loaf, which I transformed into jack-o-lantern mini cakes! 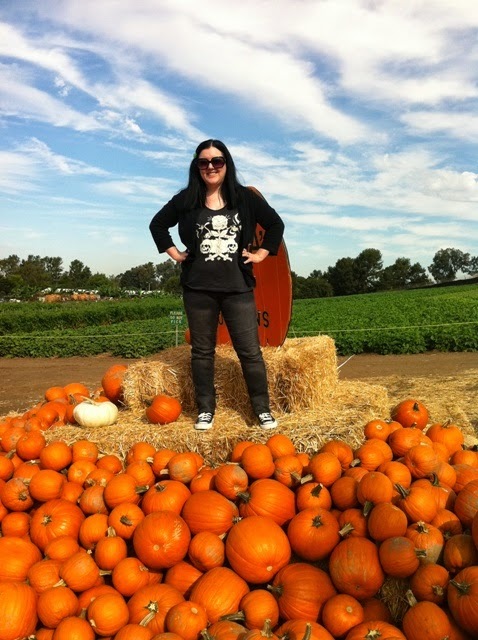 One of my annual Halloween traditions is hitting up the pumpkin patch, and my most favorite one I've been to in Orange County is located just about 10 minutes from me in Irvine! If you've followed me for a while, you probably will recognize the Tanaka Farms Pumpkin Patch as one of my most favorite places to be. I visited the pumpkin patch about a month ago (on opening day back in September), but still wanted to share some photos with you of this gorgeous gourd garden! 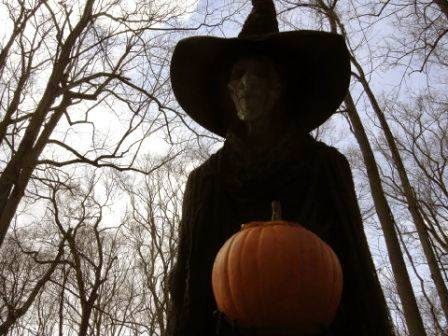 I wish I could visit in the middle of the night on Halloween (I still can't believe it is only two days away!) and wait for the Great Pumpkin! I discovered the art of Naisa Gómez Plúguez just a few months ago on Instagram, but since then I have been absolutely enthralled by her artwork. 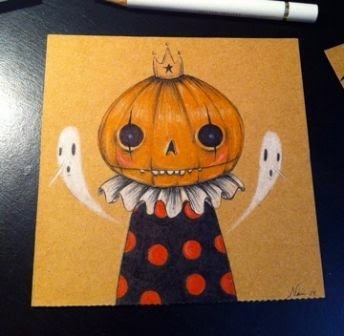 Naisa draws spooky little characters that are so imaginative and express so much emotion. Her art is very much like pop surrealism, and kind of reminds me of some of Mark Ryden's work with a touch of Camille Rose Garcia, but completely unique in its own right! The Anaheim Halloween Parade celebrated its 90th year Saturday night in the downtown district. For all my years living in Orange County, this year was the first time I had ever heard about this parade! What really interested me in the parade were the vintage floats, displays and decorations they still use as well as the rich history of the parade (which you can read all about here). I have been following the float-building progress on their Facebook page and just couldn't wait to attend! I love this Halloween shirt! Every year I try to buy Halloween-themed shirts to add to my collection, but this year the pickings have been rather slim. However, just last week I discovered AwfulArt.com, which is the art of Nathan Willison, and found my new favorite Halloween tee for 2014! Drew Daywalt has directed a lot of excellent short films, so I am always excited to see any of his new horror shorts! I recently discovered a short film he wrote and directed called Selfie. It was actually released around Halloween of last year, but it must have slipped under my radar as I just saw it for the first time recently. 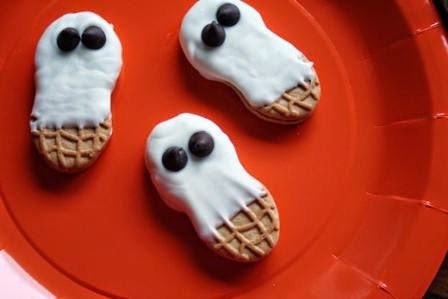 I had to share it, though, since it is so well-done and such an appropriate bite-sized treat for the upcoming holiday that is just a few short days away! Pumpkins make dreadful sunny days bearable. When the lovely ladies at Queen of the Track asked me to do a guest post on their online zine, I was thrilled! I absolutely adore the content of their blog, especially their Halloween series, so I was more than happy to contribute! 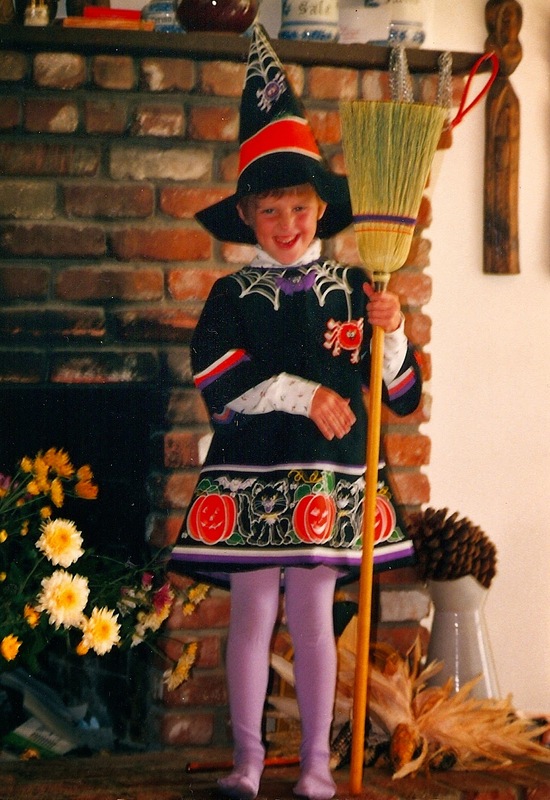 Since they are based in the UK, I thought it would be fun to write about how I celebrate Halloween in Southern California even though I have to suffer through cruel sunny days (it's gross, trust me) and there is no fall foliage whatsoever (damn you, palm trees!). Still, I have some tricks and treats that help me invoke the Halloween spirit despite the uncooperative weather/location - and you can read all about them over at Queen of the Track HERE! After reading, you should check out the rest of their site, including some truly amazing articles on horror films and novels, female villains, and my personal favorite at the moment, poems based on Final Girls in horror movies by Amy Roberts! Read more here! Pretty sure it is my favorite new site, and I am just so happy and humbled they asked me to guest blog! Please give them a look and a follow on Tumblr, Facebook, and Twitter! Just one week to go until the best day of the year!! Are you seeking to invoke the spirits on Halloween but need a little otherworldly help to set the mood? Look no further than these haunting inspirations for ghostly decor that will surely entice apparitions and party guests alike to attend your spooky soiree. Did you know pumpkins are packed with vitamins, antioxidants, anti-aging properties, fiber, minerals and more?! This squash's health benefits are plentiful and varied, and this is the perfect season to make all kinds of dishes with them! 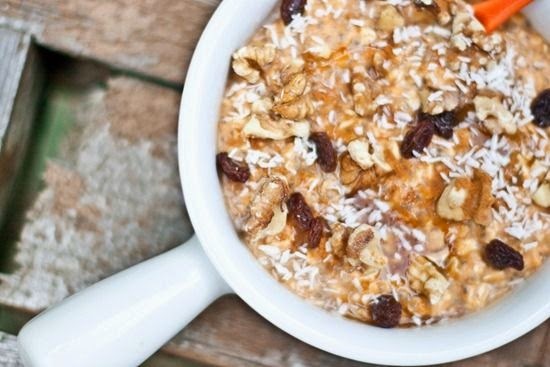 I've already shared a few recipes that utilize pumpkins as the star ingredient, but here is another one of my favorites! 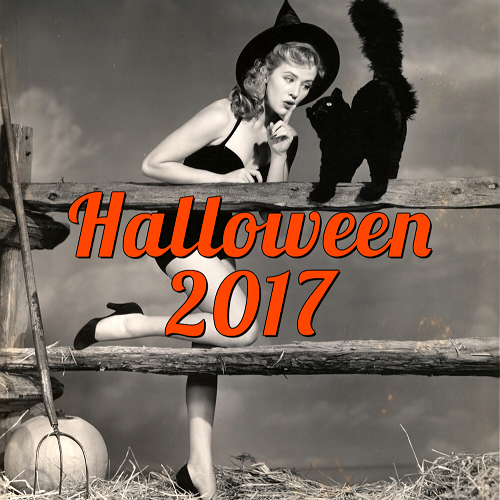 I have shared the stunning videos from YouTube user Nocturnaloner in past countdowns (check out Kingdom of Witches and All Hallow's Eve), but I just recently discovered a new video from him/her that I must have missed last year! 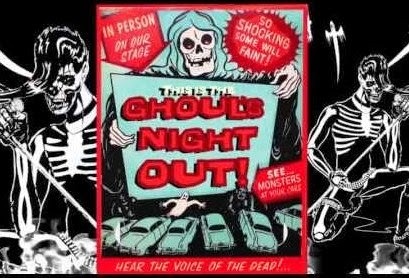 It is a fun sing-a-long lyric video to the song "Ghoul's Night Out" by the Misfits! 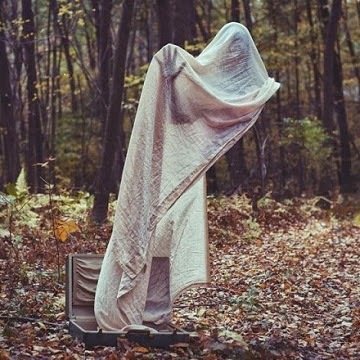 The haunting photography of Christopher McKenney is dark and surreal. I love how his images evoke conflicting reactions of both awe and repulsion. His photos deeply resonate with me, and to me speak of the impermanence of people and of life itself, and how little by little, day by day, it diminishes until there is nothing left. 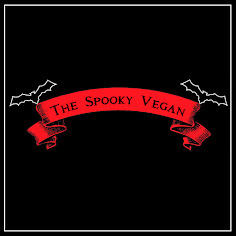 I was excited to learn that Vegan Cuts’ monthly subscription snack box for the month of October would be curated by one of my absolute favorite vegan personalities, the Vegan Black Metal Chef! The Vegan Black Metal Chef (or VBMC) creates some awesome and easy vegan recipes and presents them in epic black metal music videos, complete with corpse paint and some wicked kitchen utensils that I am really jealous of! He writes all his own black metal music, and sings/growls/screams his recipes in his videos (SWOON!). 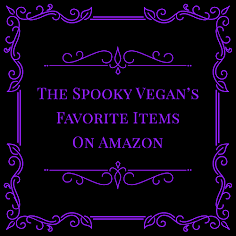 So how perfect that the Vegan Black Metal Chef hand-picked some of the snacks for Vegan Cuts during the spooky month of Halloween! Since I've chosen ghosts and hauntings as the overarching theme for this year’s 31 Days of Halloween, I thought it would be fun to explore some supposedly haunted locations in Orange County (virtually of course!). I have always been fascinated with haunted locations, whether they are the typical historic haunted houses or otherwise nondescript modern structures that have perhaps witnessed tragic events. Whether you believe in haunted places or not, there are just some locations that put your nerves on end, give you the shivers, and make you feel like something unseen is watching. While browsing the fantastic site Halloween Short Films (also a member of the great 31 Days of Halloween countdown! ), I found this gem of a short film, called Trick or Treat, that was made back in 2010. I love the atmosphere of this short, as well as the costume of the killer! Check it out below! Every year it seems that we get more and more vegan candy options to hand out to trick or treaters, to serve at parties, or to munch on ourselves! I have an insatiable sweet tooth, so I am always prepared with lots of vegan candy options come Halloween. I like to hand out some to trick or treaters (if any stop by), but mostly I end up eating it myself or sharing with friends when they come over for pumpkin carving parties or horror movie nights! Reason #1,375 why I love Halloween so much - there are so many creepy-cute accessories and jewelry pieces that are styled with a gothic aesthetic! I love stocking up this time of year because not only are they perfect for Halloween, but also year-round for spooky little girls like me! 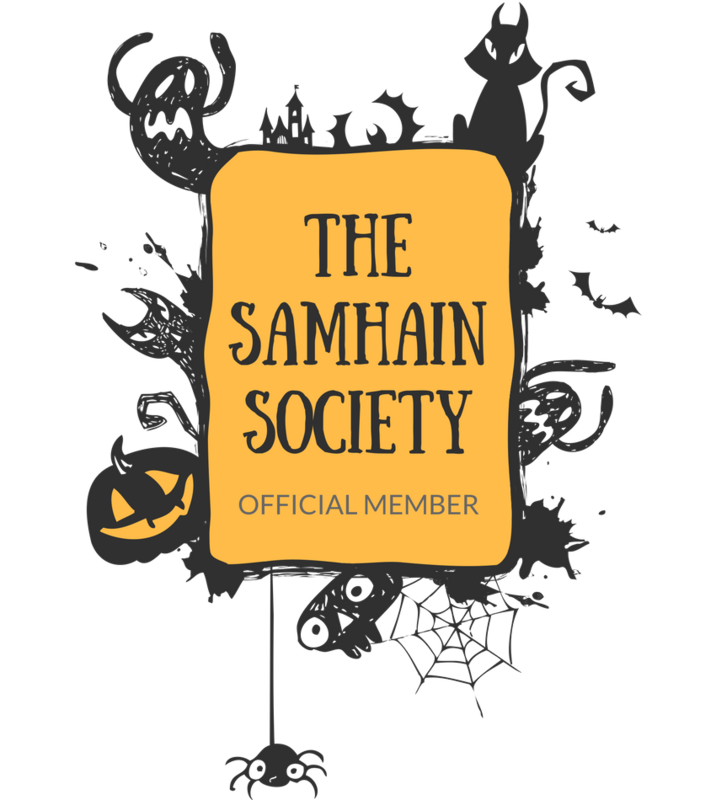 Below you will find several independent companies that make the spookiest, most beautiful gothic accessories! Many are local to Orange County and almost all are owned by women (with the exception of an incredible candle company). I love supporting local, independent companies, especially when they make gorgeously gothic products! Ghouls and boils, have you checked out the Fork and Beans site? It is one of my favorite recipe sites because it has so many inventive recipes, year after year and for any occasion. I especially love the Halloween section of the site, as the culinary genius behind the recipes is Cara, who adores this time of year as much as I do! 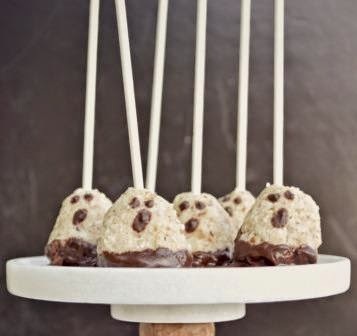 Her boo-tiful Halloween food creations have me awwwwwing and drooling (quite an awkward situation to be in if you're in a room with strangers), plus her recipes are simple and easy to make. In sticking with this year's ghost theme, I've found some hauntingly helpful ghost makeup tutorials that will help you come up with the scariest, most impressive ghost costume this year! 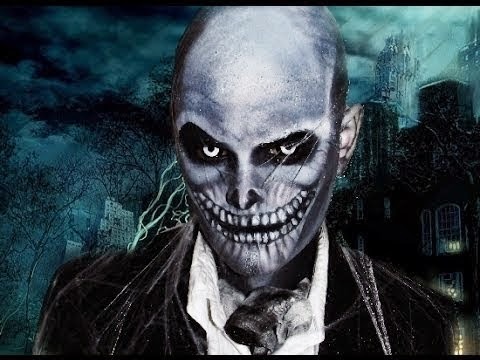 Watch these terrifyingly talented makeup artists create some stunning ghost looks and learn how to do them yourself! I cannot believe I haven't featured Heather Gleason on this blog yet! I was so convinced I had previously written about her that I spent the last 10 minutes searching for posts about her and her art. I fondly remember the serendipitous day when I found her art booth in Sleepy Hollow/Tarrytown while on vacation in New York last year! It was such a delightful surprise and I remember wanting to buy ALL her boo-tiful pieces (unfortunately I didn't have the room in my luggage, plus we had taken the train upstate and I didn't feel like hauling everything back into the city with me). I still regret not buying any of her art that day. 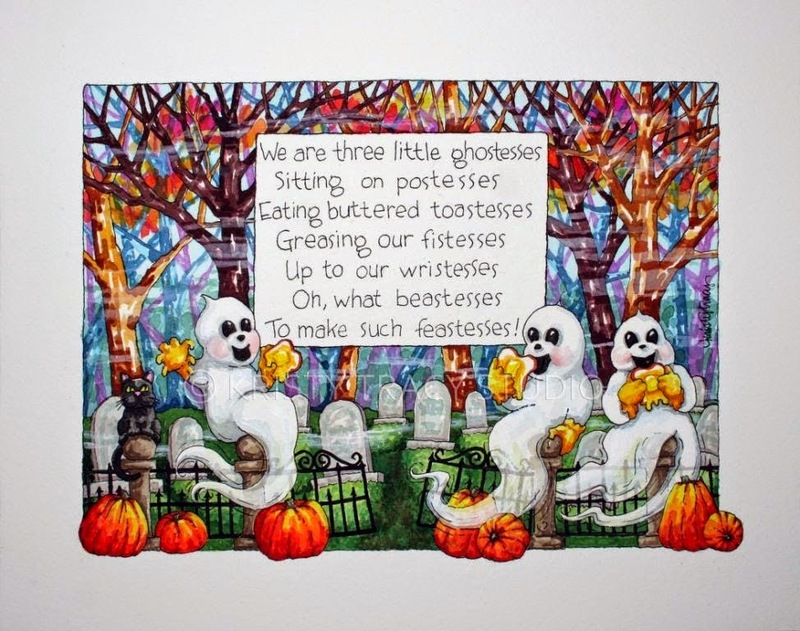 When I was younger, I remember having a book about three little ghosts that really enjoyed toast. I was obsessed with that book, but I don't know what became of it. I think it may have been an old nursery rhyme book, but I can't remember exactly. I've scoured the web for it (I remember the accompanying pictures of the little ghostesses on postesses enjoying toastesses), but didn't have any luck. I love curling up with a spooky book, and now is the perfect time to delve into a creepy book that will immerse you in Halloween spirit! There are lots of horror books you can read this time of year, but I like to enjoy scary books that are Halloween-themed or at least set during Halloween. I wrote about 5 of my faves a few years ago, but I wanted to share a few more that I love reading this time of year! This year’s picks vary from horror novels, to picture books, to children’s books and even non-fiction books about the holiday! 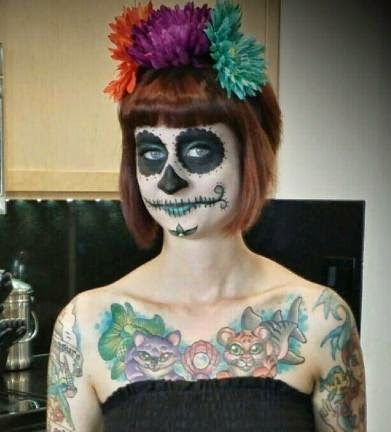 I have a few favorite vegan vloggers that I consistently watch - The Vegan Zombie, Vegan Black Metal Chef, and today's featured personality, York and Spoon, otherwise known as Jenelle York, Your Vegan Punk Pinup, whose Cheesy Pumpkin Fondue recipe I will be sharing! Not only is Jenelle as sweet as can be, her video series are always informative and fun, plus she is a licensed nutritionist and knows her stuff! It seems like I always learn something new with her videos, and her easy-to-follow instructions are a godsend to people who are kitchen-clumsy like me! She thoroughly explains all the steps to her recipes, and she makes it so easy to follow along. There is just something about vintage Halloween magazine covers that puts a big ol' smile on my face. 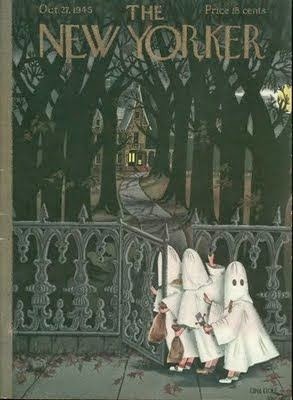 I mean, even modern magazines with Halloween covers make me happy, but the artwork and photographs on older magazine covers have that certain something that can have me gazing at them for hours! While we stress over the most creative and clever costume to wear this year, sometimes you just have to go with the classics (like my previous post on ghost costumes!)! That brings us to Personal Creations, who is supplying the nostalgia this year with an illustrated look back at the past 25 years of popular Halloween costumes! Their illustrated guide includes one hit wonders like V for Vendetta and long-time favorites like Spiderman. Who would've thought in the 90s we'd be seeing just as many Teenage Mutant Ninja Turtles decades later? See the full guide below and share it from Personal Creations. What else is more classic for Halloween than a good old ghost costume? 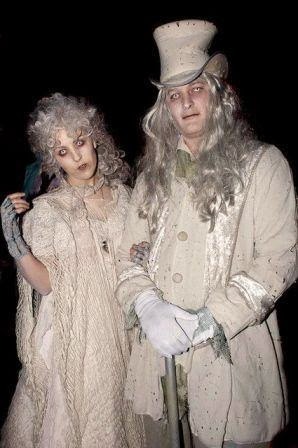 I love ghost costumes not only because they are a classic, but because they are so versatile. The ghost costume can be as basic or as elaborate as the wearer wants. For example, you could dress up in fancy Victorian clothes or opt to just throw a white sheet over your body! And there are so many options and different ways to go with a ghost costume! You could be an evil ghost, a beautiful ghost, a scary ghost, a romantic ghost, an historical ghost, a famous ghost...the list goes on and on! Isn't this the cutest breakfast EVER?! And it is so easy to make, too! Some people might know Rhode Montijo as the comic book artist who created Pablo's Inferno and co-created the cartoon Happy Tree Friends, but I will always associate him with the book The Halloween Kid, which is an adorable children's book about a pint-sized Halloween buckaroo! 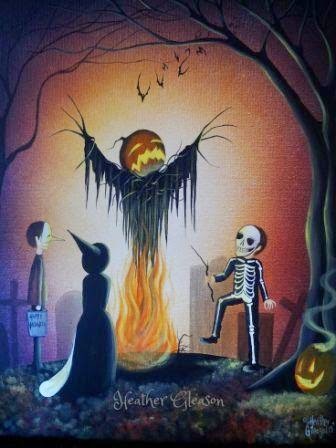 Besides The Halloween Kid, Montijo has many other Halloween artwork that I adore! 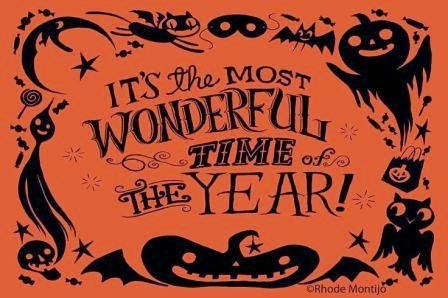 His vibrant, almost vintage-feeling designs are always full of so much Halloween joy and they never fail to put a big ol' smile on my face!! I hope to one day own one of his original works (or at least a nice print)! Last week, I was ecstatic to discover So Delicious' coconut milk non-dairy frozen desserts in the new Candy Corn and Pumpkin Spice flavors at my Whole Foods! I have been looking forward to these vegan ice cream treats ever since I saw sneak peeks of them a month or so ago. If you are a lover of all things Halloween like I am, you should be excited for these cuties, too, especially since they come in pumpkin or candy corn shapes! 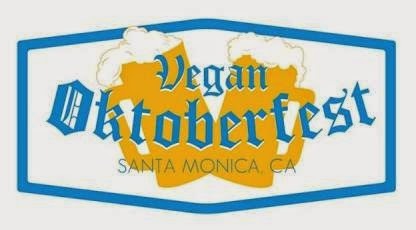 This past Saturday I attended the first ever Vegan Oktoberfest, held right on the beach in Santa Monica, California. Oktoberfest is such a quintessential October celebration, I was so, so excited that we finally had an all-vegan option for this celebration of drink and food! I had grabbed early-bird VIP tickets (cost: $50 each, though after the early bird sale they went up to $65 each) pretty much the day they announced the event many months back, so I had been eagerly anticipating attending this vegan event. I absolutely adore Pumpkinrot, a Halloween artist that creates some amazing props for his home haunts. He also created a haunting short film a few years ago called "Swamp Foetus". The short features some really cool puppets and props made by Pumpkinrot, and I really love its eerie atmosphere and ghostly score. You can check out the short below, and please check out Pumpkinrot's incredible blog for Halloween treats year-round! It seems fitting that since today is the Vegan Oktoberfest in Santa Monica, CA that I share some vegan autumn beers with you! First, I'll explain what makes a beer vegan, then I'll get to sharing my "wish list" of vegan autumn beers! Califia Farms just announced their new Pumpkin Spice Latte Cold Brew Coffee earlier this week, and I already found it at stores yesterday! This is another one of those “holy grail” vegan items that have been released this autumn season, and we certainly are being spoiled this year! I am so glad Califia Farms has released this, since Starbucks' Pumpkin Spice Latte is not vegan and making your own is kind of a pain. This is the perfect treat of cold brew coffee mixed with Califia Farms’ delicious almond milk and warming pumpkin spice! There are lots of eerie events and activities going on this month in Orange County that are sure to get you in the Halloween spirit! 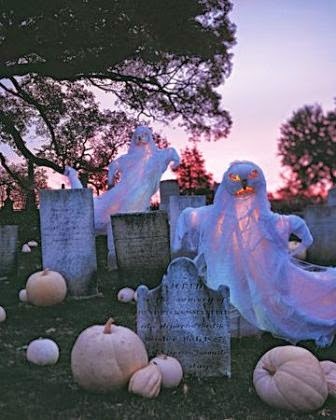 There seems to be something for everyone, from scary mazes for adults and teens, to kid-friendly pumpkin patches, to jaw-dropping Halloween displays everyone can enjoy! I've compiled a handy list of some of the haunting happenings in Orange County and also listed a few events that will occur beyond OC since they were just too good to leave out! You can check out my list below, though please note this isn't an all-inclusive list of all Halloween events. If you have a favorite event I've left out, please let me know in the comments! 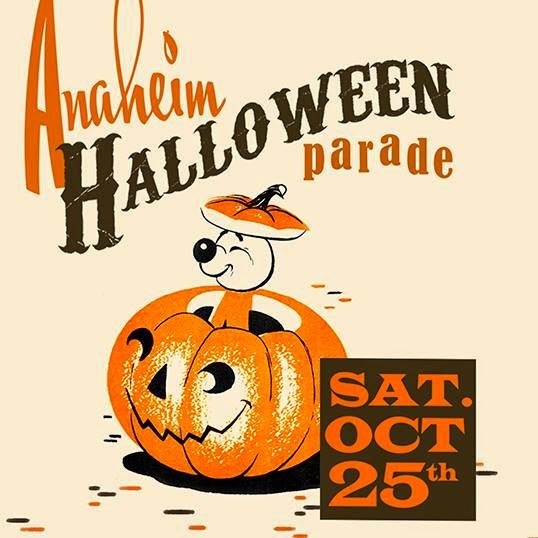 Join in the fun with Anaheim's Halloween parade on October 25th, 2014, which has been celebrating the season since 1924! Fantastic floats, a Miss Fall Festival competition, and lots of Halloween activities at the end of the parade route round out this fun tradition! This is a free event to attend, but any activities, games, etc. are extra. A brand new product was released at Trader Joe's for the 2014 Halloween season - Pumpkin Joe-Joe's! If you are familiar with the Trader Joe's grocery stores, you'll know that they usually have some kind of Halloween-themed Joe-Joe's, but I have never seen pumpkin ones before! If you aren't familiar with Trader Joe's, their Joe-Joe's are like Oreos! And they are also "accidentally vegan" (unless you feel strongly about processed sugar - however, like I've said before, veganism is all about intent and not perfection, so I am fine with being 99.9% vegan, meaning I don't stress about possible trace amounts of animal ingredients). I know many people that prefer the Joe-Joe's to Oreos and they appear to be a bit healthier than regular Oreos (they are still cookies though, so it's not like they are health food!). 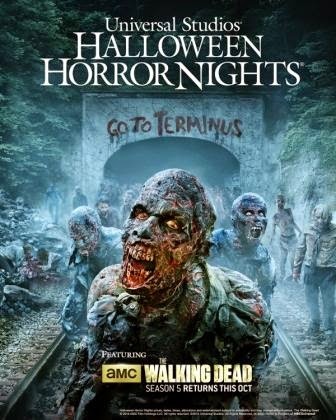 I got to attend my first EVER Halloween Horror Nights at Universal Studios Hollywood this past Saturday! I can't believe I had never attended before, and my first time was made even more special by a very generous friend who spoiled me with VIP tickets! I wanted to share a bit of my experience and let you know what I thought of it all. The glorious return of Trader Joe's Pumpkin Body Butter! Last year, Trader Joe's came out with decadent Pumpkin Body Butter, which sold out in like 2.5 seconds. I bought two tubs last year, and by some miracle I made them last until this September. Smelling like Halloween year-round was pretty fricking incredible, but I was in despair when I used up the last tub. Luckily, Trader Joe's just stocked their shelves again with this magical Pumpkin Body Butter, so the day it came out (September 29th) I rushed to the store and literally made them go into the back and pull out the box of pumpkin body butters! I grabbed four tubs, because the employee who was nice enough to fetch them from the back said they only get one small box for the season, so when they sell out they don't get any more. When I got home I realized I should have just bought the whole box of 50 or so tubs and sold them on the black market to make a small fortune...oh well!